Shared Monitor is a tool that provides network administrators and users with a quick and convenient way to view and manage connections to the resources of your server or a local computer. With Shared Monitor you can control selected users'connections or access to certain files and folders on the computer. The statistics includes active connections reports and connection log. If you wish, you can generate an HTML report with complete set of data. 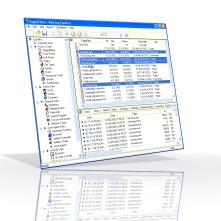 With Shared Monitor you can view the statistics of open files, user names, connected computers, folders, file types, etc. You can also create, edit and delete shared resources. When you manage active connections, you can: close, send messages to remote users who opened a shared resource, close all files in a certain folder, close files of a specific user, etc. For example, you can send a message to all users who opened files in the SharedDocs folder and ask them to close the files they're using. The program has a feature of defining responses to a new session or to opening a file. You can specify responses for all sessions/files or for selected files of selected users. The following responses are available: warning the user, closing the file or session and sending a message to the user who is using the resource. Shared Monitor is a tool for the day-to-day monitoring of computers in the network. Shared Monitor runs under Windows 9x/Me /NT/2000/XP and allows you to control active network sessions on your computer and see which files are opened on your through the network. It will give you information about summary of connections, sessions, open files, users, computers, folders, file types and more. You may export the gathered statistics as a report in HTML format. Shared Monitor enables you to close sessions or open files if necessary. You can also manage your shared resource (a disk or folder or printer): Close sessions, close open files, send message to user etc. Shared Monitor enables you set up reaction on new session or opening of files. Shared Monitor runs from your system tray. Your system tray is the area on your taskbar that contains your clock and all your system tray programs. You're welcome to submit any questions, suggestions and comments about Shared Monitor! Please let us know what you would like to see in the future versions here please. Enter your email to receive information about Shared Monitor updates. This address will not be used for any other purposes. Web Log Explorer Web log analysis on-the-fly. Get as deep into your log files as you need to! Web Log Suite Generate detailed reports from raw log. Analyzes most popular log file formats. WMS Log Analyzer Log Analyzer for analysis Microsoft Windows Media Services server raw log files. WMS Log Storage Generate detailed reports from Windows Media Services raw log files. Proxy Log Explorer The Proxy Log Explorer is application for monitoring usage of Proxy server. Power PDF Compressor Power PDF Compressor is a fast, powerful PDF file compression tool.